Driving on the narrow hill roads in Himachal Pradesh many of us may have come across lazy drivers driving ahead at abysmally low speeds. This forms a trail of vehicles honking at each other with a view to overtake even at risky corners jeopardizing their very lives which many a times do end with a collusion, As the vehicles involved in the collision may be finding faults with each other, the smiling lazy driver moves on, little concerned of the accident he had caused. It pays to keep your cool on hill roads, advises an experienced taxi driver. A widely travelled driver on hilly tracks, he shares that there are various kinds of lazy drivers he encounters in his day to day experience. The first category is that of those arriving from other states on a leisure trip to the hills. Sitting beside their spouses or partners they prefer enjoying the scenic views as they drive along. Their driving is all the more risky as they tend to drive some time at neck brake speed on the straight track of the road not allowing others to take a pass, and then suddenly coming to a zero speed as they approach the bends specially the blind curves. In case they are sitting beside the other gender, such drivers are more unpredictable. The taxi driver further related me a horrific incident as he had tried to overtake a Punjab number plate vehicle on the Kufri – Chail road, when the tourist driver had hurled abuses upon him while showing a loaded gun in his hand. “Tourists having larger sized vehicles especially from Punjab and Haryana states are more rowdy on the roads and must not be offended,” he cautioned. The second categories of lazy drivers are the ones driving transport vehicles carrying loads of material beyond their capacity to carry. They are very dangerous as incidents have been there when such trucks have turned turtle damaging the other vehicles moving along. These trucks, he shared, were either not fit for the hill roads, are overloaded or are driven by drowsy and at times intoxicated drivers. Bellowing clouds of black smoke, such dangerous vehicles are unfortunately not noticed by any of the authorities at check posts or on patrolling duties. These clumsy drivers are ill concerned of the traffic jams they tend to cause on the already narrow and broken hill roads. As one moves within the cities, one comes across local buses, specially under private operation, inching their way to their destination. These local buses look forward finding more passengers at the next approaching bus stops, especially when another bus on the same route had overtaken them. They keep moving at zero speed and taking lot of time allowing passengers boarding and deboarding enroute. To fulfill their motive they may too create a trail of vehicles behind them, honking to get a pass at some corner. Fourth category of the lazy drivers are those who keep moving at a snail’s pace not allowing others to take a pass and finally squeezing their vehicles into the available parking space along the road. In case of larger vehicles like buses this ordeal may continue for miles together. 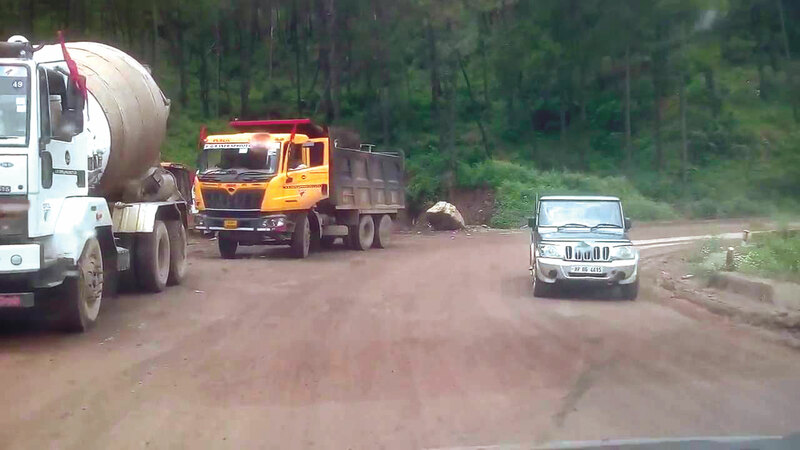 Since in Himachal there are no designated parking spaces along the highway for buses and trucks, such drivers are free to park wherever they want or find space. To give way or not depends upon their sweet will. The fifth categories of such drivers are those clinging their mobiles to their ears. This is too a dangerous class of drivers, specially the youngsters who may be chatting with their dear ones for hours together. Unfortunately there are no traffic cops to check such offenders on the roads. Driving at leisure they may be causing irks to scores of office goers trailing them perforce. Under the Indian Motor Vehicles Act there are laws to check speeding beyond the prescribed limits, but alas none for SLOW DRIVING. Holding the others to ransom. Previous articleHimachalscape social Poll- Is the one way traffic plan envisaged by the district administration workable and viable for an average citizen of Shimla?